They were presented in a small box adorned with a lovely photo featuring a sun setting over water, cliffs and a meadow. In it, the golden-red hues of the sun gently backlight the threaded clouds so that their edges glow an iridescent yellowish-orange, leaving the silhouette of the threads a deep aqua. As the rays of the setting sun dance off the water of the Gulf of St. Lawrence, your eyes are drawn to the foreground where there’s a rambling field divided by a snake-rail fence. Idyllic. It looks like a photo of Newfoundland, and it is. While Canada is a country of beautiful landscapes and special places, Newfoundland has achieved a mystical quality because it’s the only province I haven’t been to. I already know that when I get there I’m not going to want to leave. And Newfoundland has great chocolate too. 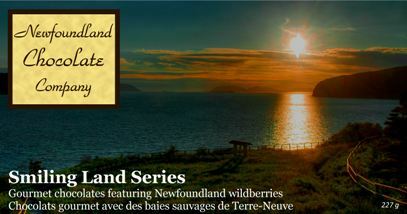 Made by the Newfoundland Chocolate Company, The Smiling Land series features Newfoundland berries: cranberries, blueberries, cherries, wildberries and partridge berries that are surrounded in creamy light, dark and white chocolates. Not only do they rival the much-celebrated European chocolates for flavour, they’re exquisitely designed. The ‘map’ inside is of Newfoundland and part of Labrador, with the chocolates placed around it, each named after a different village or geographical area: L’Anse aux Meadows, Gros Morne, Mistaken Point and Signal Hill to name a few. Down the right is a description of each chocolate and my favourite is for the Terra Nova: A succulent blend of Newfoundland blueberry with rich dark chocolate. I didn’t actually try the Terra Nova, but I say it was my favourite because there was a little piece of chocolate still stuck on top of the word ‘blueberry’ that I had to resist gnawing off with my teeth when no one was looking. My two were Lake Melville and Cape St. Mary’s, the first with “Purity partridgeberry/apple jam and a whole macadamia nut,” and the second with the same filling but in dark chocolate, with a delicate blue filigree design on top of the chocolate that made it worthy of a display in New York’s Museum of Modern Art. The box began to empty but it still beckoned as me and my book club mates pretended that after tasting one we “couldn’t possibly have another!” But we did. And I’m glad.